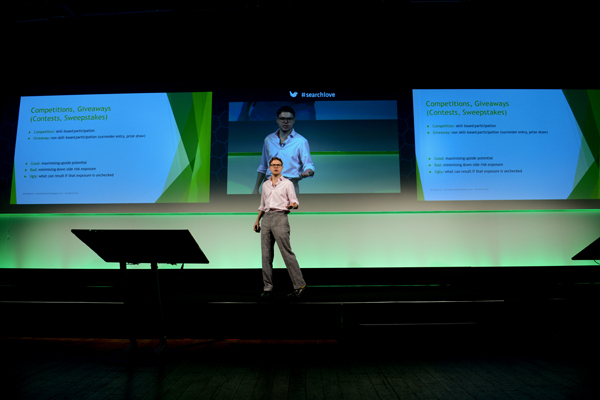 I was delighted to be asked by Will Critchlow, CEO of Distilled, to speak about promotional marketing at their Searchlove conference. It’s fair to say that it’s a very heavy weight conference in terms of speakers, attendees, and presentation material. SEO is naturally the focus, but the prevalence of promotions in the online marketing “mix” these days (including for SEO purposes) meant there was solid interest in a topic like this. It was a pleasure to share the stage with the likes of Wil Reynolds and Rand Fishkin. The title of the presentation, “Promotional Marketing: The Good, Bad and Ugly” was designed to give actionable direction in maximising the upside potential of a campaign, flagging potential sources of conflict, non-compliance, and PR blowback, and demonstrating what can happen if downside risks are not addressed. The Competition Agency is a prize promotional marketing agency that specialises in prize draws and competitions for retailers, technology startups, universities, charities and not for profit organisations. We also work extensively alongside marketing and PR agencies.